Sanrensei is a Japanese opening term that means "three star points in a row." It's most commonly used to describe an opening pattern wherein a player plays three star points on one side. The sanrensei became one of the defining openings of the Shin Fuseki period and modern era of go. The sanrensei's first recorded appearance was in Aug. 1933 in a match between Kitani Minoru and Maeda Nobuaki. Kitani established the sanresei position as Black. The second appearance of the position was the following month again by Kitani, but this time as White. The timing of the first appearance of the sanrensei coincided with the beginning of the Shin Fuseki period. As the period progressed the sanrensei became one of the most played examples of the Shin Fuseki ideas during the 1930s (with over 200-game records before the end of the decade). As the rise of komi-go continued, so did attempts to find ways to counter it as Black. A reinterest in large moyos took off as a result, most notably with the explosion of the Chinese fuseki in the late 1960s. As the Chinese fuseki gained popularity throughout the 1970s so did renewed interest in the sanrensei. The most famous proponent of the sanrensei is Japanese professional Takemiya Masaki. He first gave serious consideration to the opening in 1970-1 during the 18th Nihon Ki-in Championship. He would continue his experiments in 1974 during the 29th Honinbo League and 11th Pro Best Ten tournament. By 1981, his interest became full-blown and commentators nicknamed his play the cosmic style. The fact that Takemiya was both a top contender and proponent of the sanrensei helped to increase interest in the opening from the 1970s-90s. The sanrensei decreased in popularity among professionals around the turn of the millennium, but has since remained popular among amateurs. The sanrensei strategy is an influence-based approach rather than a territory-oriented one. The aim is to build a moyo so large that the opponent will be induced to invade or reduce it. Once this occurs the sanrensei player will use his influence to launch an attack on the opponent's invading/reducing group(s). Depending on the outcome of the attack, spill-over may occur affecting the opponent's other groups around the board. It is through this process that the sanrensei player will realize his gains. As such, the sanrensei (and all other moyo based strategies) is a long-term attacking strategy. One strength and weakness of the sanrensei is its ability to let the player dictate the direction of the game. As the attack begins the sanrensei player is the one who initially chooses where the direction of the game will go. However, this decision also requires the player to possess strong positional judgement and attacking skills. Attacking too aggressively or passively, or in the wrong direction can result in insufficient compensation. However, in another sense it is the opponent who chooses how to handle the sanrensei formation. The sanrensei player is left to wait and see how the opponent will try to handle the situation, and in turn must be ready to react in different ways to the opponent's counter-plan. Another strength is the pressure that it can put on inexperienced opponents. If the invasion/reduction of the moyo is too early, then the sanrensei player may be able to switch strategies more flexibly and come out ahead in the opening. If invasion/reduction of the moyo is too late or shallow, then the sanrensei player may be able to simply complete the surrounding of the large moyo, and punish the opponent with an even stronger attack when the opponent tries to invade/reduce too late. And if the invasion/reduction of moyo is too deep, then the sanrensei player may be able to attack the group more severely than otherwise, resulting in a clear advantage or death of the invading/reducing group. Another weakness of the sanrensei is its more narrow nature. The sanrensei is invested on three fourth line points, and all on one side of the board. This affects the ways in which the player naturally wants to expand & solidify territory, and the player's presence at other parts of the board. In this latter sense, the sanrensei cannot be considered a speedy opening (the sanrensei is not trying to establish a presence all around the board). 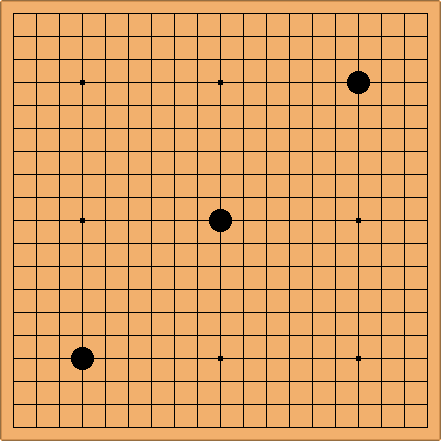 Finally, if White attempts to build a sanrensei while the opponent is doing likewise (or forming any other other large moyo formation), then White will be required to be the first to respond to the competing moyo (as Black is always one move ahead by virtue of moving first in the game, thus can be first to complete his moyo). The diagonal sanrensei involves two opposite star points and tengen. It was a traditional handicap placement in ancient Chinese go and was written about in the classical book Sanzi Pu. A sanrensei evolves from a nirensei. It is possible for a sanrensei to turn into a yonrensei. For dissenting opinion see High-concept opening myth. For recent evaluations on statistics, see the sanrensei files. The so-called "Sanrensei Low Variant" isn't actually a sanrensei variant, because its three stones don't all lie on star points.